Mayflower has been described as a "sausage-dog horse"
A pony with short legs and a long body has caused numerous people to call the emergency services in the mistaken belief she is stuck in the mud. Hampshire fire crews were last alerted on Tuesday as Mayflower was grazing by the River Test in Southampton. An animal rescue expert said Mayflower seemed to be a cross between a Shetland and a New Forest pony, making her look like a "sausage-dog horse". Her owner is now considering erecting signs advising passers-by. Rescue specialist Anton Phillips said Mayflower could appear to be stuck in mud as she was half the height of other nearby ponies. "We have been called out several times for the animal now and it is getting a bit ridiculous. "We are changing our mobilising policy for this particular area now and in future we will only send out an animal rescue specialist to evaluate the call-out before sending a full team out," he said. "These calls from the public are with good intent. 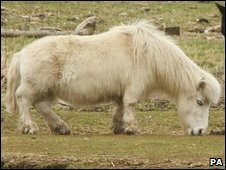 When viewed at long range, this pony looks like it is trapped, particularly if it is standing still next to its mates which are twice its height."